With one exception, formally trained architects were rare in later nineteenth and early twentieth-century Utah. The exception, Joseph Don Carlos Young (1855-1938), the last surviving son of Brigham Young, was the first architect in Utah to receive a formal education. He majored in civil engineering at Rensselear Polytechnic Institute in Troy, New York, from 1875 to 1879. After graduating, he engaged in railroading and engineering and was a two-term Utah territorial legislator before turning to architecture. In 1887, he succeeded Truman Angell, Sr., as LDS Church architect and remained in that position for fifty years. From 1886-1887 he taught Mathematics and Architecture at Brigham Young Academy in Provo. During 1888-1889 he taught Mechanical and Architectural Drafting in the Department of Fine Arts at the University of Utah. 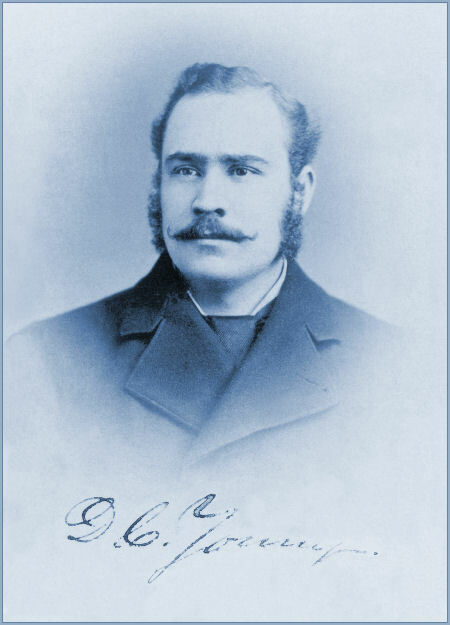 Joseph D. C. Young returned to Brigham Young Academy for the 1899-1900 school year to teach Mathematics and Architecture. Under rather unusual circumstances, Karl G. Maeser and other members of the BYA Board turned to Young to design the new Academy building, which was completed and dedicated in January of 1892. In 1906, Young practiced in partnership with his son, architect Don Carlos Young, Jr.* -- a partnership that continued until 1915. Don Carlos Young, Jr. was born August 5, 1882 and died on December 8, 1960, both events in Salt Lake City, Utah. The Salt Lake City Temple, considered a fine example of Romanesque Gothic architecture, was started by Truman O. Angell on April 6, 1853. Mr. Angell did not live to see his work completed and his assistant, Joseph Don Carlos Young, son of Brigham Young and architect of the Brigham Young Academy building, finished the project on April 6, 1893. 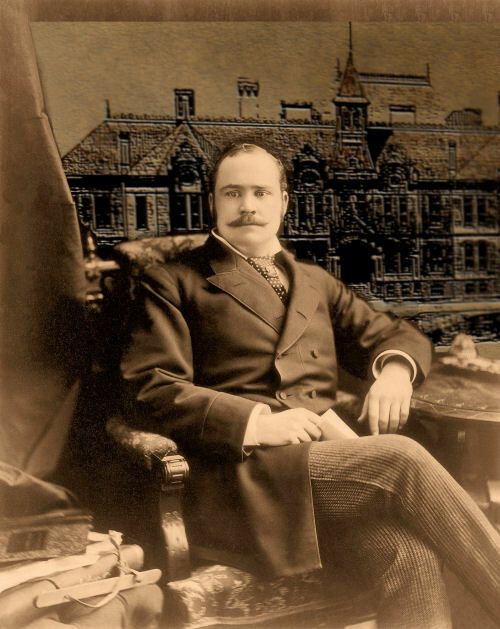 Joseph H. Young, a grandson of Joseph Don Carlos Young, continued the family tradition of architecture. At age 74 he had worked on more than 300 buildings and was still an active architect. 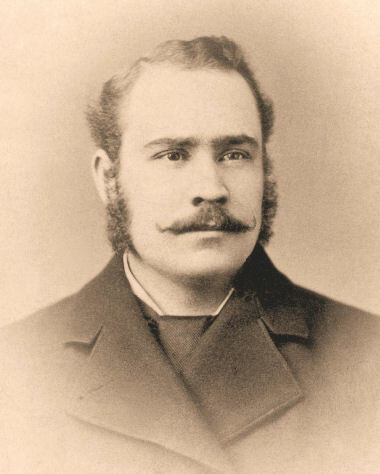 Don Carlos Young, Jr., father of Joseph H. Young, was a primary architect for the original LDS Church Office Building on South Temple and he also worked on the 28-story LDS Church Office Building on North Temple. 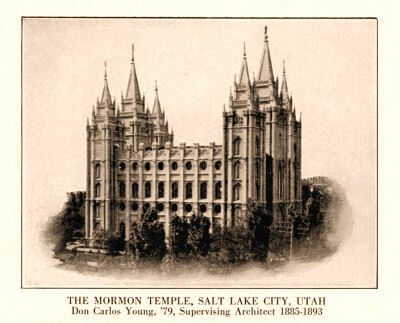 Joseph H. Young stated that his grandfather, Joseph Don Carlos Young, not only supervised the completion of the outside of the Salt Lake Temple, but also designed all of the interior. He also changed Mr. Angell's plan to build the spires out of wood wrapped in sheet metal to granite just like the walls below. Joseph Don Carlos Young, Architect, was born May 6, 1855 at Salt Lake City, Utah. His parents were Brigham Young and Emily Dow Partridge. He was first married September 22, 1881 at Salt Lake City, Utah to Alice Naomi Dowden. They had ten children, six sons and four daughters. He second married Marian Penelope Hardy on January 11, 1887, in Juarez, Mexico. He died on October 19, 1938, in Salt Lake City, Utah. * A note about names, thanks to David Young Thomas, great-grandson of Joseph Don Carlos Young. J.D.C. Young did not use "Sr." after his name, nor did his son Don Carlos Young "Jr." have the exact same name. Don Carlos Young, Jr. did not have "Joseph" as his first name, but he was so often mistaken by name with his father that he added "Jr." to the end to make sure they weren�t confused.